Reservations for the mothership are managed by Ocean Light II Adventures. Group size is eight guests plus the skipper, cook and two certified kayak guides. Six CD Breeze single kayaks are provided on the mothership cruise. One Looksha T double kayak is also provided. as well as accomplished kayakers. 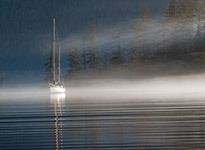 Explore Haida Gwaii onboard the most spacious mothership yacht operating in Gwaii Haanas National Park: the splendid 71' ketch, Ocean Light II. The Ocean Light II provides our roving base, allowing us to enjoy incredible flexibility during guided kayak day-trips. After each exploration, we return to fabulous meals and warm accommodations onboard this comfortable and capacious oceangoing vessel. During the kayak excursions, our two certified sea kayak guides provide local knowledge, professional risk management and the option to develop your paddling skills. Guides carry VHF radios to communicate with the mothership crew. This enables individuals, or the entire group, to be picked up in convenient locations. Each mothership cruise is unique, no two days are alike. We generally launch the kayaks in the morning and return to the Ocean Light II at midday to relax and enjoy a leisurely lunch. We travel each day to a new location onboard the mothership. Daily activities may include shore excursions, as well as fishing and wildlife viewing onboard the Ocean Light II. Alternatively, we may pack our lunch and venture out on a more extended paddling excursion, to rendezvous with the Ocean Light II later in the day. For photos, please see the Mothership album. Our eight mothership guests are provided with six Current Designs Breeze single kayaks plus one Looksha T double kayak. Each mothership guest is provided with the choice of a wide variety of paddles, including: Lightweight Aqua-Bound carbon straight-shaft paddles, as well as ergonomic wood bent-shaft paddles made by Bending Branches. Our carbon paddles are noticeably lighter than wood paddles, yet some kayakers prefer the aesthetic qualities of wood. The tour begins in Sandspit, British Columbia. Guests are picked up at Seaport B&B (or another Sandspit accommodation of your choice) for the one-hour van ride to Moresby Camp. Here, you board the Ocean Light II to begin exploring Gwaii Haanas National Park. 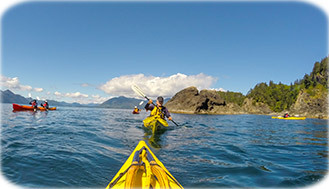 The kayak mothership cruise is a comfortable adventure with an emphasis on wildlife viewing, guided kayak day-trips and the rich cultural history of Haida Gwaii. Silently kayak through remote, pristine coves. Discover ancient Haida villages. Explore the awe-inspiring outer coast. The eight-day sailing itinerary takes us down the east coast of Moresby Island. This coastline is particularly well suited to exploration by kayak mothership. Ocean Light II provides restful, seaworthy transport along the more challenging and exposed sections of shoreline. 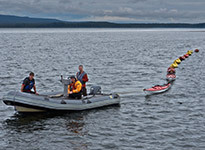 Each day we anchor in different sheltered locations and launch the kayaks to quietly explore Gwaii Haanas National Park. Visit the historical Haida village sites of Tanu or Skedans. Explore the magnificent old-growth forests of Windy Bay, view the Gwaii Haanas Legacy Pole and paddle through the intertidal channels of Burnaby Narrows. Spend a day at the ancient Haida village of Ninstints on Anthony Island. This extraordinary United Nations World Heritage Site is also known as SGang Gwaay. Numerous totem poles overlook the village and longhouse ruins are still visibly prominent. Haida Watchmen on the island can explain the carvings on the poles and provide insightful interpretations of the village and their ancestors who once lived there. Explore this unforgettable site and experience the sense of mystery that lingers in the ancient village. The paddling opportunities are endless along this diverse coastline. There are hidden, sheltered waters where you can enjoy tranquil kayaking, even on relatively windy days. For the more adventurous, Hecate Strait and the open Pacific provide a sense of the vast ocean, bordered by magnificent rock formations and cliff faces. Nature-viewing and photographic opportunities abound. 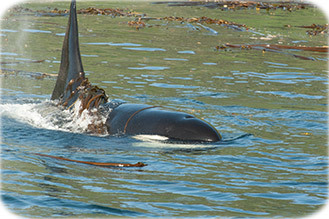 Populations of whales and dolphins are regularly sighted in the area. A wide variety of seabirds are abundant throughout the region. If conditions permit, we visit Cape Saint James, at the southern tip of the archipelago. 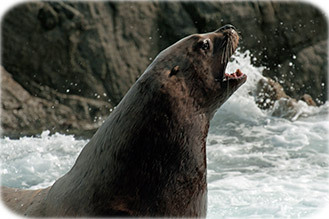 Hundreds of sea lions live at the Cape; it's a truly wild, vibrant and spectacular marine environment. Near the end of the cruise, we may go ashore at the tiny, isolated community of Rose Harbour to view the remains of the old whaling station and meet the local homesteaders. Our two kayak guides are dropped off in Rose Harbour on day seven. 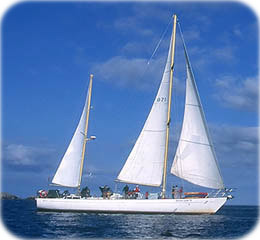 The group remains onboard Ocean Light II to enjoy a final cruise up the coast of Gwaii Haanas. After breakfast on day eight, you board a floatplane for the short, scenic flight back to Sandspit where you are returned to Seaport B&B, or another Sandspit accommodation of your choice. The mothership cruise is provided by two companies working in close cooperation. Butterfly Tours and Ocean Light II Adventures combine resources to make this unique journey possible. Reservations for the mothership are managed by Ocean Light II Adventures. For mothership space availability and registrations, please contact Jenn; owner, first mate and cook onboard the Ocean Light II. Registered guests of the mothership cruise can contact Gord to request access to Butterfly Tours' password-protected online resource, where additional trip information is available. This trip is a guided mothership kayak tour. Some other tour companies offer unguided mothership trips. During the mothership tours we offer, certified sea kayak guides accompany guests during the kayak day-trips; there are very limited opportunities to paddle without the guides. If you would prefer to kayak extensively without guides, a different mothership tour company may be a better choice for you. Alternatively, Ocean Light II Adventures offers a variety of different trips in Gwaii Haanas and throughout the coast of British Columbia. There is one double kayak available on the mothership; all the other kayaks are singles. If you would prefer paddling the double, please inform Jenn as soon as possible. Jenn manages the mothership reservations; she will know if other registered guests have already requested the double kayak. Routes and itineraries remain very flexible to accommodate changeable west coast conditions.